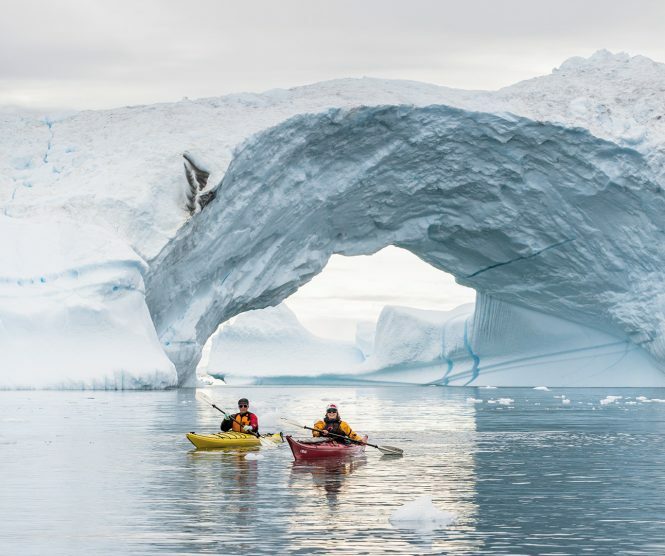 Kayaking in Disko Bay, where icebergs calved from the Sermeq Kujalleq glacier flow through from the Ilulissat Icefjord. The July sun hangs above the town of Uummannaq like a fixture spraying light from the top of the world. We’re 650 kilometers north of the Arctic Circle in western Greenland, yet it’s warm enough—around 18°C—for short sleeves and smoothies. Just offshore in the fjord, an iceberg three stories high and as wide as a small apartment building glows luminously in the dazzling midday light. Visiting Greenland has been a longstanding ambition of mine. As a child, I’d look on maps at the great wedge of land over America and just wonder what, and who, was there. Many years later, on a flight from New York to Europe, I finally saw the world’s largest island for myself, its massive ice cap spread out 11,000 meters below like a vast desert of frost. Denmark, which has governed it since the 18th century. Economic development and environmentalism, globalization and heritage, grind against one another like the tectonic plates deep below the softening permafrost. And yet, during my 12-day cruise up the island’s west coast aboard the MS Fram, a 127-cabin expedition vessel operated by Norway’s Hurtigruten group, few of the Greenlanders I encounter on our shore excursions seem overly concerned about any of it. The island settlement of uummannaq at the base of its namesake mountain. 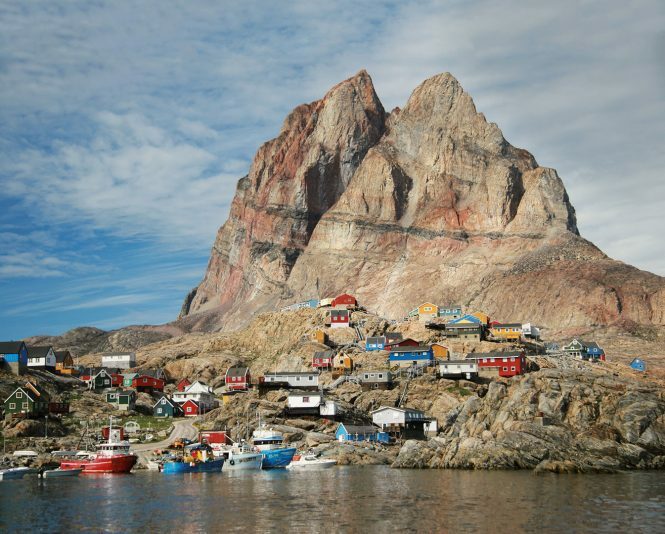 In Uummannaq, which lies on the southern tip of a small island in a fjord of the same name, the dock is busy with fishermen baiting lines. One of them, Ole Qvist, is happy to chat about the eternal world of Greenlanders—Inuits who crossed an ice bridge from what is now northern Canada to the island 4,000 years ago and settled on its coastal fringes. Qvist has lived in Uummannaq his whole life and seems happy about most things, save perhaps his waistline. “When I was a young man,” he tells me, “I was a champion dogsled racer. But now,” he sighs, “it takes seven dogs to pull me.” As for global warming, Qvist is enjoying some unexpected benefits: the superb Greenlandic halibut now swim closer to the surface, so he is able to pull up more and bigger fish in a lengthening season. But he is not happy about every change. I walk to the other side of the harbor to a café where Norah Jones is playing on the radio over the hiss of milk being foamed for a cappuccino. Here are the young people Qvist has in mind. A teenage girl in jeans and sneakers, with turquoise earrings and a blue tattoo just behind her ear, sips an icy fluorescent-yellow drink through a straw. At another table sits a couple who introduce themselves as Winnie and Jens. Winnie wears wraparound sunglasses. One of Jens’ biceps is covered by a tattoo. They look like visiting Europeans. In fact, they own the café and have always lived here. The Internet brought the world to them, and they want to be part of it. They are Greenlandic in their hearts, they say. They describe winter in Uummannaq— subzero temperatures, three months without sunlight—with a warmth that I suspect you have to be from a cold climate to understand. The polar night descends, the aurora borealis spreads its sparkling web of electrified light, and spirits come out. They say they have encountered ghosts, and that they once used shamans to exorcise their home. Before leaving, I gaze out the window at Mount Uummannaq, the 1,188-meter heart-shaped summit from which the village takes its name. For the 1,300 people who live there, the mountain, all rose-hued granite and gneiss, re-presents permanence. What changes is the ice. A beam of sunshine seems to set the iceberg just off the dock ablaze with white light. “Will that melt in the course of the summer?” I ask Jens. The MS Fram in Uummannaq Fjord. Despite global warming, most of Greenland is still ice, which covers 95 percent of its landmass, or 1.7 million square kilometers. At the summit of its ice sheet, the ice piles more than three kilometers high and has pressed the land beneath it almost 360 meters below sea level. Antarctica has almost 85 percent of the world’s ice; Greenland has 12 percent—35 times more than Alaska. Not surprisingly, the Greenlandic language, which is Inuit—people here can communicate with Inuits from Alaska—has a prodigious vocabulary for ice, words that describe pack ice, melting ice, ridged ice, and rime, ice that stretches across vast expanses, ice in all its forms on the surface of water. The ice has architecture. We cruise past pyramids and ziggurats, towers, colonnades, and arches. Some massive icebergs sit on foundations of refulgent blue, or enormous crystalline plinths. Sometimes, they seem sculpted into images: one looks like a sailor wearing a rain-soaked cap. The water is as calm and cold as a cryogenic bath, and yet, because the air is warm, the bergs are sweating curtains of rain. Sailing into Disko Bay, the Fram brings us to the Ilulissat Icefjord, a vast field of icebergs calved from Sermeq Kujalleq, the Northern Hemisphere’s most productive glacier. This is Greenland as I imagined it would be. 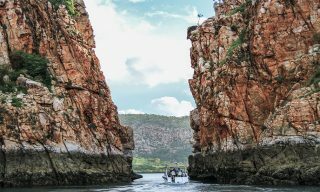 To get a closer look, I head out in a sturdy tender boat with seven other passengers and a guide named Steffen Bierstack. As we glide over the sea, I keep turning, twisting, and repositioning myself to take photos. Greenland’s landscapes, and especially its ice, make me greedy, even a little maniacal, for pictures—to freeze, as it were, ephemeral moments. Only 10 percent of an iceberg is visible. Above the surface, they can be the size of aircraft carriers. They don’t melt evenly, so they often become unbalanced, rocking back and forth until they break or tilt or flip, sometimes triggering tsunamis. Or they present other dangers. A little more than a century ago, one floated down from Ilulissat into the North Atlantic, where it collided with an ocean liner called the Titanic. Steffen had gone out earlier that morning to scout the fjord, and there is one iceberg in particular he is eager to show us. “Here it is!” he announces as we navigate a bend in the channel. It’s an enormous plinth of crystal. Icebergs are packed ice; they’re white and opaque. But this one, 12 meters long and six meters high, convex and ridged like a clam shell, is a miracle of translucence and clarity. The light cascading through its surfaces makes the water all around it sparkling and lambent, like stars on the surface of the fjord. Cruises along greenland’s elemental, ice-hewn coastline afford views of vast fjords, granite peaks, mammoth icebergs, and hanging glaciers like the one pictured here. “I’ve never seen anything like this before,” Steffen exclaims. It is indeed remarkable, and I wonder if even the Greenlanders have a word for it. He’s out for long periods. It takes six hours to put down 900 meters of line and two hours to pull it up, which is done with a hydraulic lift. This, he says, is when a fisherman is most vulnerable to the immediate effects of climate change. The icebergs are breaking up and sending out sharp, fast-moving blocks of ice that can splinter a boat like a torpedo, and in this cold water, falling in is certain death. A trail on the other side of town runs over meadows carpeted by luminous grasses and wildflowers—purple mountain avens, yellow poppies, buttercups. The lushness is normal, not a symptom of climate change. Ilulissat, with modular houses painted in bright reds, yellows, blues, and greens, feels fantastically isolated; here at its edge, that feeling gives way to an expanse that is wonderfully open and free. This feeling is what Greenlanders cherish, and it’s what they say they want for themselves. But apart from fishing, prospects to develop a viable economy are limited, and their best hopes—namely, mineral and oil resources—are trapped under all that ice. In short, warmer temperatures may unlock the gate to independence from Denmark, and to statehood. 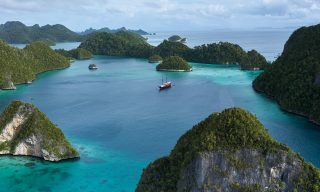 Even as indigenous people elsewhere, such as in the Maldives and the South Pacific, stand to lose everything from rising tides, Greenland’s 57,000 inhabitants see possible benefits. Toward the end of the trip, as we sail up the vast Kangerlussuaq Fjord, I ask our guest lecturer Salik what he thinks about the issue. The Icelandic capital of Reykjavík is the starting point for many Greenland cruises; Keflavík International Airport, about 50 kilometers southwest of the city, is connected by an ever-increasing number of flights to Europe and North America. Finnair flies the fastest routes from Singapore and Hong Kong, via Helsinki. 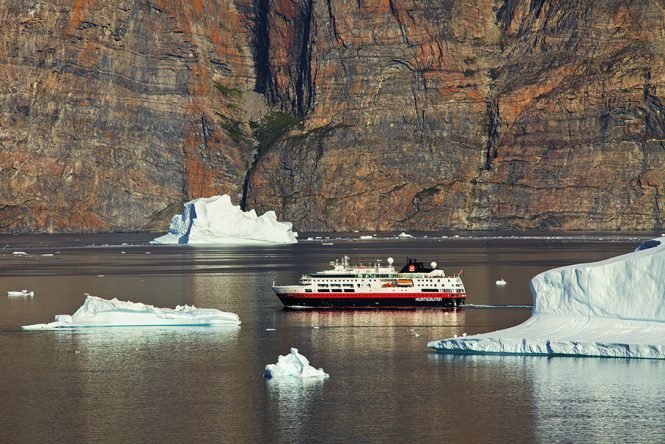 Hurtigruten offers several Greenland itineraries in the summer months. Similar to the one this story followed is the 12-day Discover the Heart of Greenland voyage, which includes flights between Copenhagen and Kangerlussuaq, the fjord-side settlement from where the MS Fram sails. 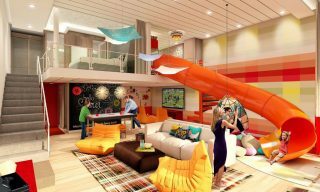 Departs July 20; from US$5,686 per person. Quark Expeditions’ 15-day Greenland Explorer cruise (which includes two nights in Reykjavík) will explore the fjordlands of the island’s south and west coasts aboard the recently renovated Ocean Adventurer. 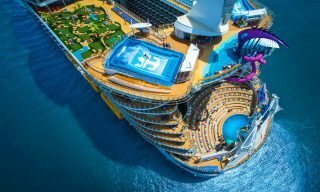 Departs August 7; from US$7,495 per person. 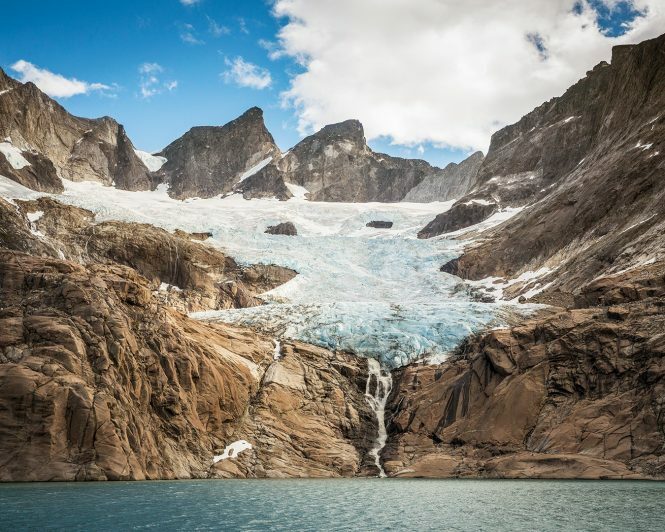 Sailing on the 81-cabin National Geographic Explorer, Lindblad Expeditions’ Exploring Greenland and the Canadian High Arctic traces western Greenland’s rugged fjords and navigates the entrance to Canada’s legendary Northwest Passage over the course of 16 days. 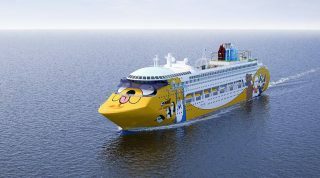 Departs August 6; from US$13,990 per person. This article originally appeared in the June/July 2018 print issue of DestinAsian magazine (“Greenland in the Limelight”).